So i recently bought a couple of Ikea STUVA to use as a enclosure for my 3D Printer and for that i needed some lighting inside the enclosure. Thinking i could save some complexity, money and wiring i picked up some IKEA STOTTA battery driven LED lights, but after a couple of days using this solution, i quickly found out that they use A LOT of battery power. I basicly discharged the 4xAA batteries used for powering the LED light in about 24 hours of use. 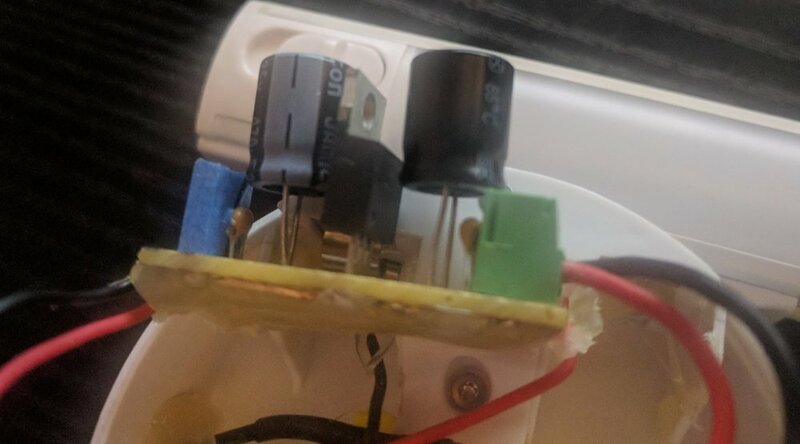 So after changing and charging batteries almost everyday, i now needed to find a better solution, I had 2 choices, either i would go buy some other wired solution or mod the lights i already had to use mains power, i chose the latter. The LED bar uses 4xAA batteries in series so about 5V, but didnt have any 5v powerbricks that i could spare, but i did have a 12V brick and some LM2940 5V regulators in my box of components. Okay, to be honest i actually already had a regulator circuit done that i made for another project, but its a pretty simple circuit using the LM2940 and 1x470uf electrolytic cap + 1x10nf ceramic cap on both input and output. Realistically the amount of filtering might be a bit overkill for this usage, but it was already made, so why not use it. So time to mod the LED bar, i took out the batteries and used my multimeters continuity tester to find what battery pads were connected to the LEDs and soldered the regulator circuits output to those pads. I then drilled a hole in the side of the battery compartment to pass in the power. insulated everything with shrink tubes and hot-glued it all in place, with the batteries out theres tons of space for the small circuit. I also added a t-dean connector to the outside power cables and powerbrick just for easy install. The result i now a well lit enclosure without the need to change batteries everyday, hooray! I might end up with just removing the regulator and use 5v powerbrick if i end up having one i can spare, but for now this works great!